The Pointe at Jamestown community is sold out and is not in active development by builder. If you are interested in The Pointe at Jamestown or similar new home communities, contact us today! Our agents are very familiar with new and newer construction in Williamsburg, and can identify resale opportunities in The Pointe at Jamestown, as well as builder inventory available in nearby or similar communities in Williamsburg. To view 10 more pictures, interactive maps and the full, detailed description of the The Pointe at Jamestown community, please Login. New construction properties turn heads in The Pointe at Jamestown. Colonists fiercely protected their new homes on this scenic land now known as Williamsburg, VA, for obvious reasons. The raw beauty of the landscape combined with the mild climate makes this place a real gem. Area attractions provide residents with opportunities for nonstop learning and adventure. Commuters can easily get to military bases in Hampton Roads such as Camp Peary, Joint Base Langley-Eustis and Naval Weapons Station Yorktown. Land one of these new homes and friends may become quite envious. The properties in The Pointe at Jamestown are well-crafted and made to endure lifetimes. Each of the new construction homes may feature a first floor master suite, breakfast bar, kitchen island, laundry room, bonus room, two-car garage, granite kitchen countertops, ceiling fans, hardwood flooring, natural gas heating, fireplace, garbage disposal, recessed lighting and much more. While some new construction developments simply offer homes, The Pointe at Jamestown gives more than mere properties. Children can run and climb on the playground. The whole family can hang out together at the park. Don’t worry about messing up those new homes when you grill out at the barbeque grills. Share that feast with friends and turn any meal into a real shindig. New homeowners aren’t strangers in this land for long, as there are many planned social events perfect for mingling with new neighbors and getting to know everyone. One of the best reasons to choose these new construction properties is the location. This neighborhood is close to shops, churches and schools in Williamsburg but even more importantly, it is close to some of the best tourist attractions in Virginia. Residents who don’t mind walking can hike down to Historic Jamestown, which is only about a mile away from these new homes. The Jamestown Marina is a perfect place for boaters to enjoy their hobby. Embark on the Greensprings Trail and admire the vast parcels of lush land that include forested areas, ponds and wetlands. The Pointe at Jamestown is the perfect spot for making memories every single day. 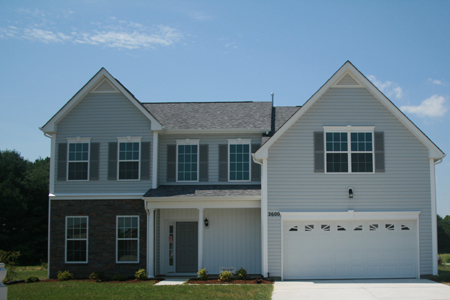 Send me more information about communities similar to The Pointe at Jamestown. Our agents gladly offer FREE property tours of The Pointe at Jamestown, Williamsburg and homebuyer consultations to all serious buyers.